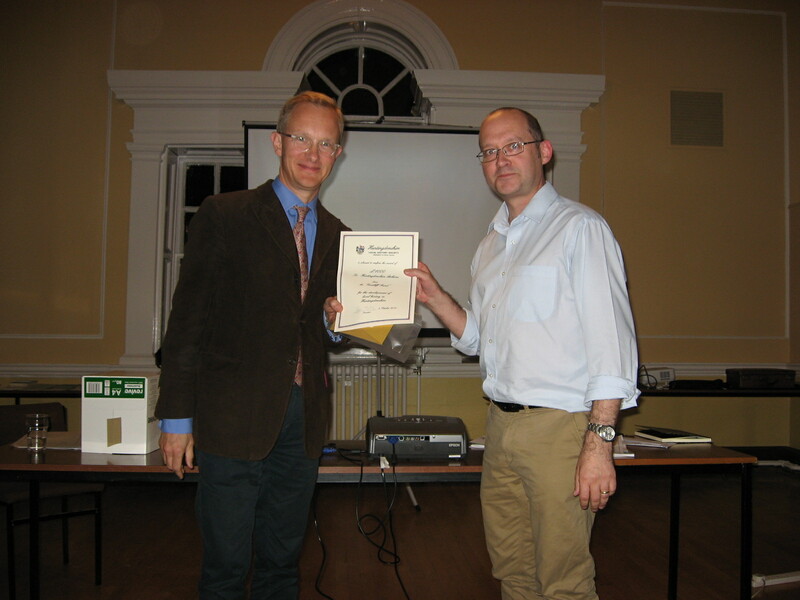 This year there were seven successful applicants for the Goodliff Awards and they were presented with their awards by Dr Simon Thurley, the President of the Society at the Award Ceremony at the Huntingdon Town Hall on 9th October 2014. Mr Alan Clark receives his award. For the past year Mr Clark has been researching material by and on the Rev Edward Bradley (1827-89), better known to the literary world as ‘Cuthbert Bede’. The Rev Bradley was curator of Glatton-with-Holme (1850—54), vicar of Denton-with-Caldecote (1859-71). 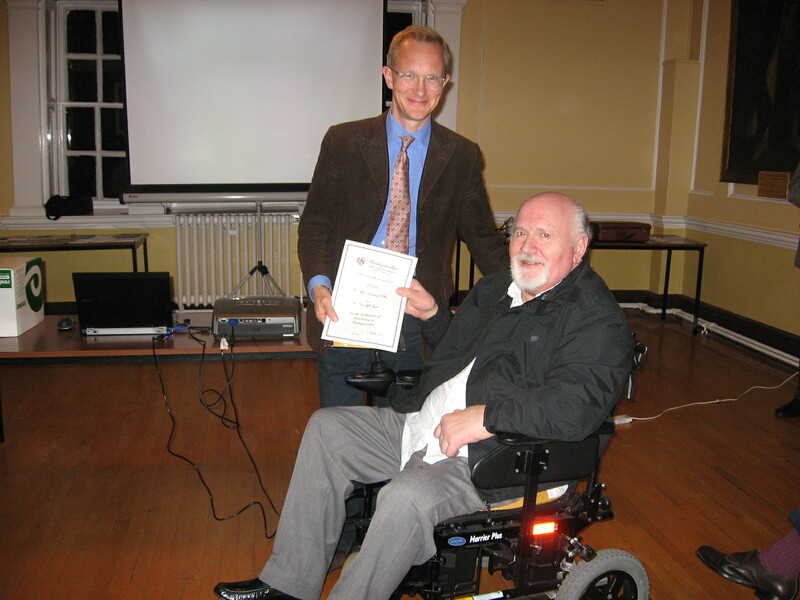 The award is to provide funds to buy a number of photographs and also help with publishing costs for his book ‘A Biography of Cuthbert Bede’. Cromwell Museum. Mr John Goldsmith, Curator, receives the award. I think we are all very aware of the plight of the Cromwell Museum from articles in the local press and involvement of a number of our Society members in the drive to keep the museum in Huntingdon. The museum is transitioning from local government controlled to charitable trust status. The award is to help the museum with the creation of the Foundation Trust and obtaining charity status. Huntingdonshire Archives. 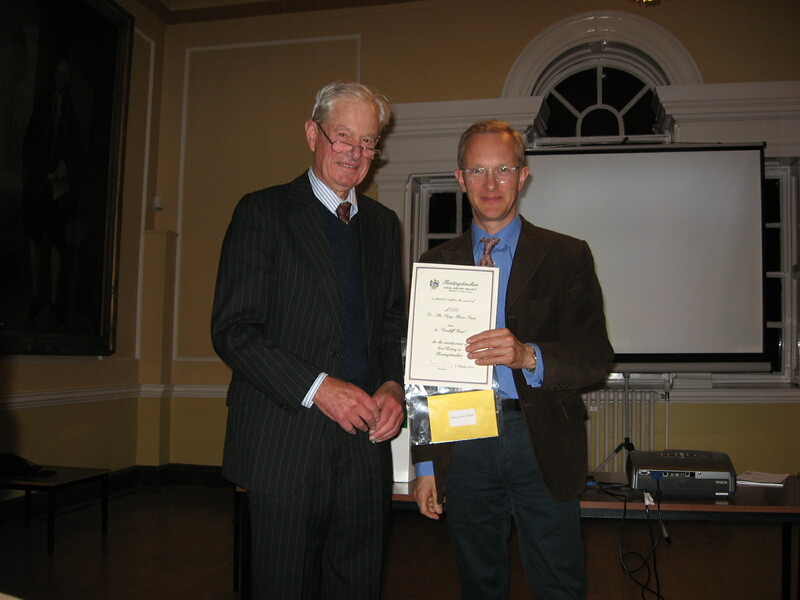 Mr Alan Akeroyd receives the award on behalf of the Archives: The Society has provided financial support to the Huntingdonshire Archives for Phases I to III of the Whitney Project to conserve and prepare digital archives of the photographic plates from the Ernest Whitney collection. The Archives is starting on Phase IV, the final phase of 900 plates, and in conjunction with the Family History Society and Cambridgeshire County Council the Society is pleased to be able to offer this award to help with the conservation activities. Houghton and Wyton History Society. Julie Walker and Davina Shrivener receive the award on behalf of the Society. At the beginning of the 20th Century the first ‘Handbook of Houghton and Wyton’ was published. A further book was published in and updated in 1987 by Dr David Hunter as the ‘Guide to Houghton and Wyton’. Since then the Society has amassed a great deal of additional information, amounting to over 40,000 words and pictures about the villages, including RAF Wyton and Houghton Hill House. The Award is to help the Society publish their findings in a new book, being relased as an update on the 1987 edition. Norris Museum. Lesley Akeroyd receiving the award on behalf of the Museum. The Norris Museum is the keeper of a large collection of papers from local ecclesiastical architect and historian Sydney Inskip Ladds (1867-1950). These papers form a treasure trove of detailed information that he described and sketched about local churches, building and items of historical interest. the Inskip Ladds collection amounts to over 10,000 individual sheets of paper of various sizes that need to be catalogued and preserved. 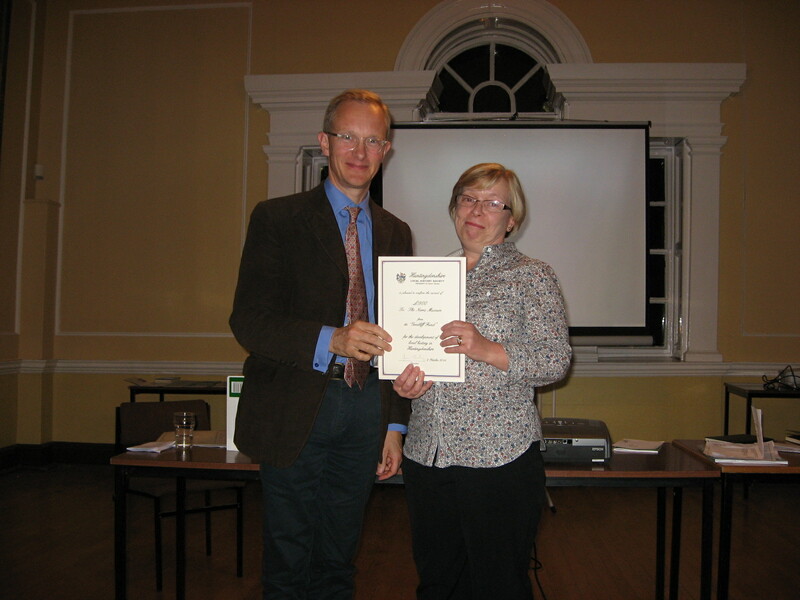 The Award is to provide funding to enable a small group of volunteers to be trained by an archivist on how to preserve these documents. Pepys House Trust. Mr Julian Curtis receives the award on behalf of the Trust. The Pepys House Trust exists to care and maintain Pepys House in Brampton, a Grade 1 listed building. The house is the only surviving house that was owned and occupied by Samuel Pepys and his family. The freehold of the house is currently owned by an overseas investment fund and although the Trust has a lease on the house that runs to 2026, they want to purchase the property outright. 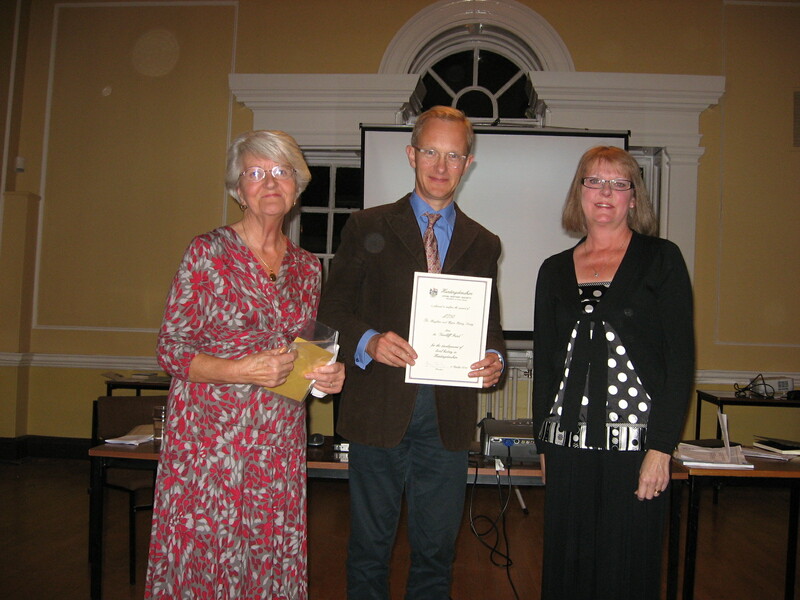 The Award is to help the Trust to undertake an ‘Options Appraisal’ to determine what would be the most appropriate future use and management of the house and gardens. The Wildlife Trust for Bedfordshire, Cambridgeshire and Northamptonshire. 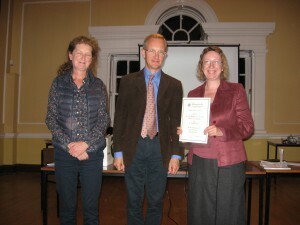 Heather Laing and Kate Carver receive their award on behalf of the Wildlife Trust. The Wildlife Trust is a partner in the Great Fen Project, to reconnect Holme Fen and Woodwalton Fen National Nature Reserves. They are embarking on the restoration of 450 hectares of land formerly known as Whittlesea Mere, including the site of a World War II Spitfire crash. The project, called ‘From Ice to Flight’ is planned to encourage local people to learn about archaeology and to hopefully get involved with the restoration work and the eventual excavation of the crashed Spitfire, X4593. 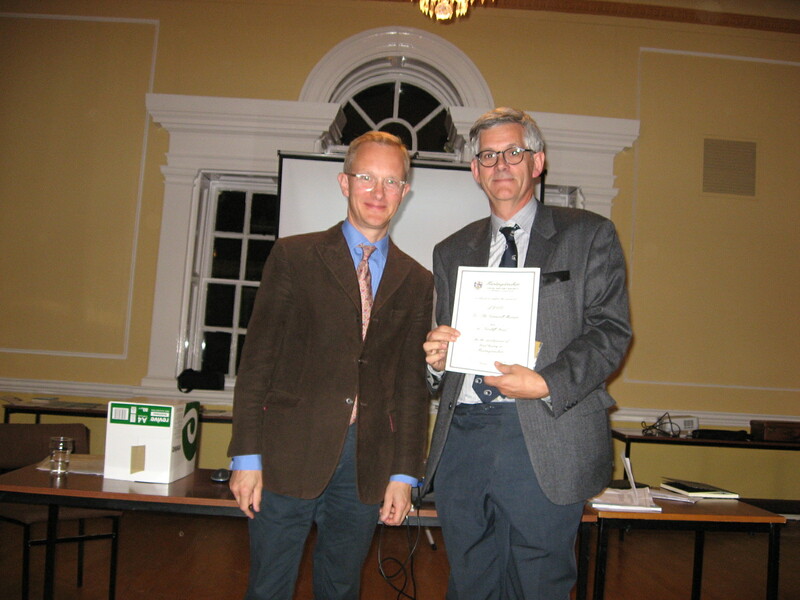 The Award is to provide funds to enable the Trust to start a community archaeology project to provide education and training to local enthusiasts who want to get involved with this fascinating venture to preserve our natural local heritage.